As much as I like the Ribbon I still find myself creating command aliases so I can access those longer commands just a little quicker. How about changing your favorite commands to 2 letters so they can be launched from the keyboard and you can still move your mouse around. I am right-handed therefore I enter keyboard aliases with my left hand and move the mouse with my right. Here is how you do that. Type ALIASEDIT at the command prompt or select from the express tools tab on Ribbon as shown. After selected AutoCAD will bring up the acad.pgp editor (shown below). Us veteran users can remember editing this file in notepad or word but since 2009 we can edit the file in a dialog box making it much easier to manage the data. We are going to change the long MEASUREGEOM command to MG. Type in your two letter shortcut, select the command from the list, and save your settings. 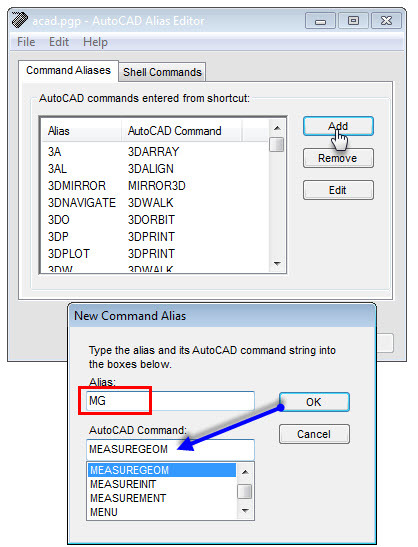 AutoCAD will save the file and you will now be able to use that command each and every time you load AutoCAD. « Can you Convert this file?